Sometimes, you just need to drop everything and make a toasted cheese sandwich…because it’s the ultimate comfort food. And some of those times, you need to kick the ingredients up a notch. 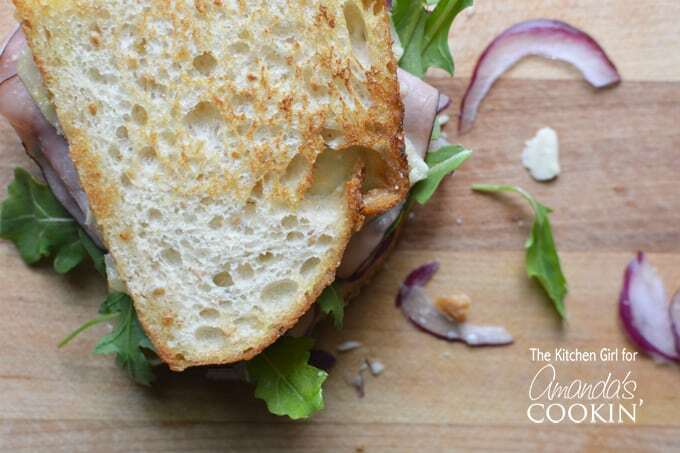 When that happens, you need Toasted Cheddar, Ham and Arugula Sandwich. We all know the comfort of sinking our teeth into a toasted cheese sandwich, right? I mean, bread…and cheese…toasted…together? There’s almost nothing quite like it. And I could practically live on those things. But, let’s elevate that experience by adding some distinct flavors to the mix, like savory and a little spice. This is where ham, arugula, and red onion step into the picture. They just know how to dance together with the white cheddar cheese. You know what else they bring to the party? Nutrients…like protein, iron, fiber, and potassium, to name a few. I can’t promise this sandwich will deliver all the necessary, daily recommendations, but it’s nice to know we’re adding great things to an already great thing! And notice, we’re doing an easy-on-the-cheese thing on this sandwich. It’s nice to lighten up sometimes. 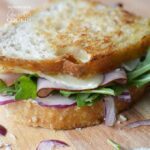 If you’re looking for another unique, toasted sandwich idea, try using a goat cheese and jam for the ultimate sweet and savory experience. I have the perfect pairing for you over on my Serrano Spiced Fig Jam recipe post. Also, if you love the idea of arugula on a grilled cheese, you might just consider making it into a spread. Pop on over to How to Make Arugula Pesto in 3 Steps. 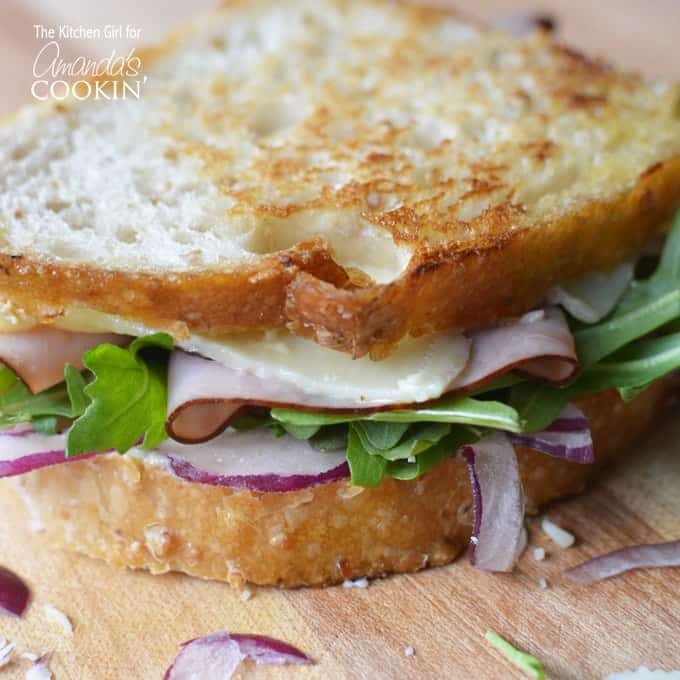 Take grilled cheese to the next level by using black forest ham and sharp white cheddar cheese, and add fresh arugula, red onion, and garlic aioli to the mix. Lay down 4 slices of sourdough bread; spread each with garlic aioli. 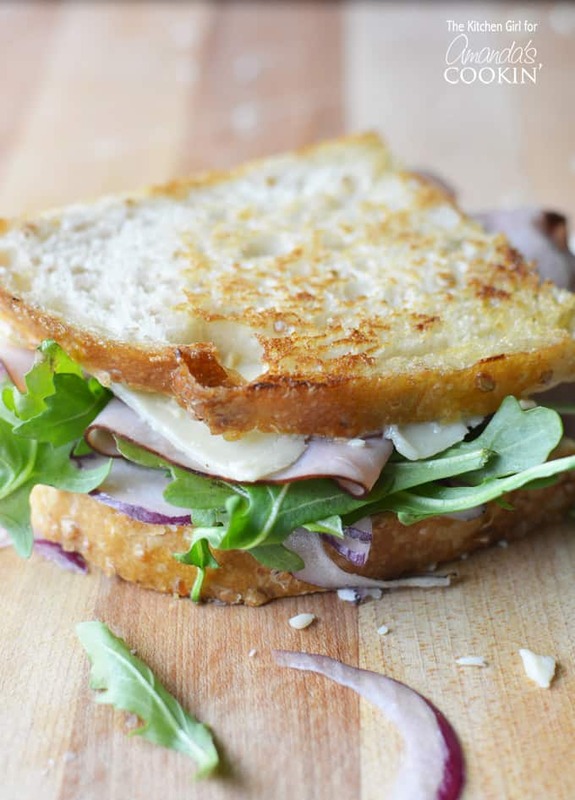 Layer black forest ham, cheddar cheese, arugula, and red onion evenly over the 4 slices; top with other bread slices. Preheat a griddle on medium-high heat; add olive oil and heat until shimmering (2 min). Place all sandwiches on oiled griddle at once; allow to heat a few minutes until surface is golden brown; turn sandwiches over and repeat process on other side; serve warm. Traci authors The Kitchen Girl® food blog, where busy people on a budget grow smart food habits. She advocates eating for wellness as a lifestyle, offering healthy kitchen tips and everyday, whole food recipes that won’t break your wallet...or your palate. She loves her job...even the ‘dishes’ part.